ARTWORK from the Kingston for Human Rights children’s art competition are set to be displayed at Shirley Burke Gallery from 7 December until 27 January. School children were asked to put their hands up and take to the canvas to create pieces that reflected the theme for the year, respect and trust. 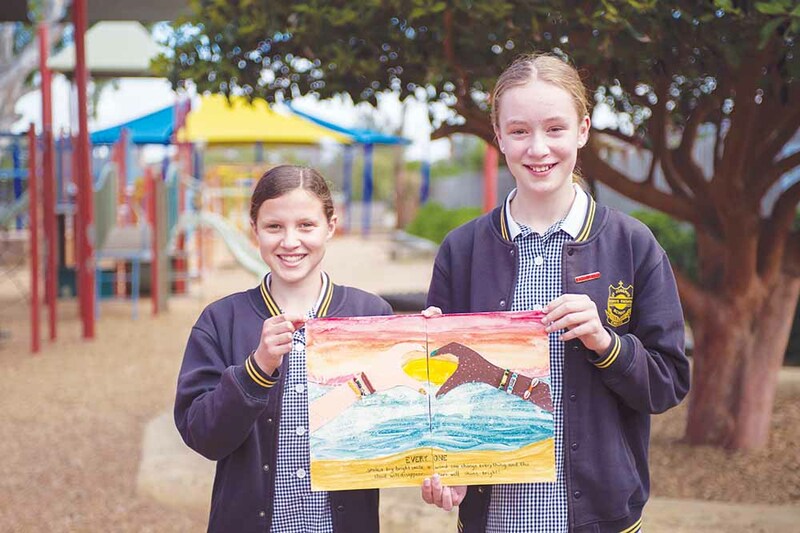 St Joseph’s Primary School students Jasmine Seymour and Elizabeth Pond were two students who got to work to create an artwork for the competition. “The message of our artwork tells us that no matter what we look like, or who we are, we all equal, unique and special in our own ways,” Ms Seymour said. Kingston for Human Rights committee member Philippa Rayment said the competition was designed to raise awareness about the importance of the International Declaration of Human Rights. “This document is a blueprint for peace. We just need people to know about it and read it. Bringing it to life through the medium of children’s art is a wonderful way to do this,” Ms Rayment said. Shirley Burke Gallery can be found at 64 Parkers Road Parkdale. The venue will host a KFRH celebration of the 70th anniversary of the signing of the Declaration of Human Rights on 10 December.